It’s easy and it’s free to anyone who lives, works, owns property or goes to school in Ohio. All we require is a picture identification and proof of where you live. A driver’s license will do. A passport or picture ID, along with a personal check or letter you’ve received will also work. Children ages 18 and under need their parent or guardian’s presence and permission before a card can be issued. Cards are not transferable. Be sure to read our Loan Policies about borrowing terms, late fees, and other details. We understand that it is not always possible for kids to get a parent or guardian to come to the library to approve a library card application. That’s why we offer the “3 for Me” card. Kids under 18 years can get this special card without the signature of a parent or guardian and can borrow eMedia and up to three books (no DVDs or CDs). Children and teens under 18 can still acquire a regular library card with the approval of a parent or guardian, but the “3 for Me” card ensures that all minors are able to check out books, no matter what their circumstances. They can request the card at any branch. 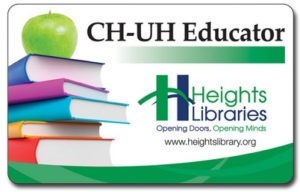 This special card is offered exclusively to educators who live and/or work in Cleveland Heights or University Heights. It allows cardholders to supplement their curriculum with an abundant, ever-changing supply of books on a range of subjects and reading levels. 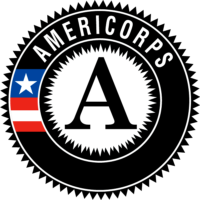 Find out more, and apply. 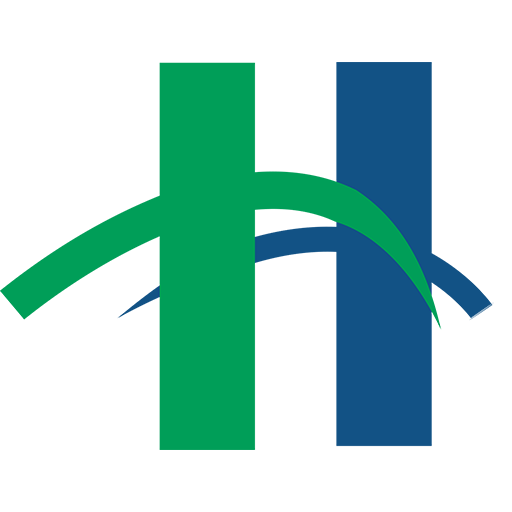 Are you in the Cleveland Heights-University Heights community temporarily? 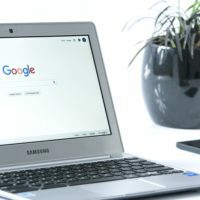 Maybe you're a college student, a professional on temporary assignment, a patient undergoing long-term treatment at one of our local hospitals, or a family member of a patient at a local hospital. 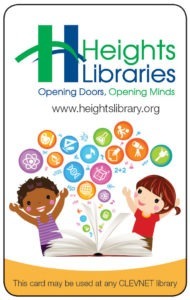 Whatever brought you here, we want you to feel welcome at Heights Libraries. As long as you are over 18 and have a driver's license, you can have a library card! Ask a staff member. Would you rather get your library materials online than come in to a building? If that sounds like you, our new eMedia Card is for you. Click here for details and to apply. 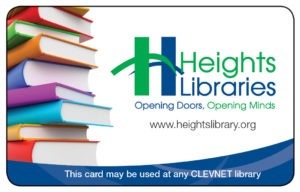 Cards are honored in any Cleveland Heights-University Heights branch and in any library participating in CLEVNET and the online catalog of Cleveland Public Library. There are 44 systems in northern Ohio that will accept this library card. Close to us, your card is good in Shaker Heights, Cleveland, East Cleveland and Euclid. Glad to have them! We participate in a daily delivery service which moves materials all around northern Ohio. You can return our books at other locations too. But please note that the item will remain on your card until it reaches the library it was borrowed from.